The first and only major book about fashion and beauty ever written by an artist, Growing More Beautiful: An Artful Approach to Personal Style is a lively, buoyant resource guide to projecting your essence with creativity and flair. The elements of making art, including many of the principles of design, help with any creative endeavor whether it is painting or creating an outfit. Not a book about aging gracefully or otherwise, but a guide for women of all ages to discover and project their unique personal style. -Get the glow by bringing more color, creativity and art into your life. Jennifer Robin's paint box of practical tips, inspiring illustrations and colorful personal insights will open your senses to the beauty of both your inner life and outward appearance and help make getting dressed a "daily act of creation." 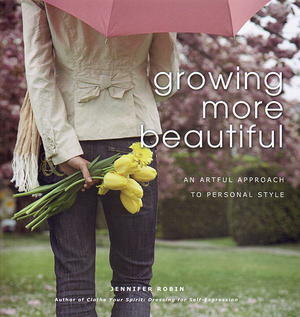 Image consultant, artist, and author, Jennifer Robin ties it all together in this stunning new book that will help you look and feel more beautiful as you grow into the person you were always meant to be.